Come in and paint or sketch. Your choice! Sign Up for just one Saturday or two, three, maybe four or more!!!! Come every Saturday if you wish!! BRING your own image or choose from an image bank I have in the studio. Bring in an object, or paint from available still life objects. Mixed media exploration, collage. and abstraction welcome! Your choice. Create and receive instruction as you develop and expand your knowledge and experience. Let me help you meet your daily painting or sketching goals. Level: All skill levels welcome. Details: Come in and paint or sketch. Your choice! BRING your own image or choose from an image bank I have in the studio. Bring in an object, or paint from available still life objects. Mixed media exploration, collage, and abstraction welcome! Your choice. Create and receive instruction as you develop and expand your knowledge and experience. Let me help you meet your daily painting or sketching goals. This is a no pressure class. No matter how advanced or novice you are…just come in set up and paint. This set up allows for you to gain instructor insight and direction sure to guide you into the next steps of your artistic journey. Below are suggested materials list based on what media you would like to explore. You can start off with Winsor and Newton Winton if you don’t want to spend the money on professional grade oils. •A pad of Arches Oil Paper -12"x16" -This will be attached to a drawing board you will need to bring. If you would like, you may work also on board or canvas, stretched at least 9 x12 to 16 x 20 inches in size, primed) 24 x 30 can also be used. •Turp (odorless mineral spirits)I like Gamsol, to thin paint and clean brushes and palette. •2 Containers for turp: one large for cleaning brushes, and one small for clean turp that you will use to thin your paint as you go. Brushes: Various sizes, preferably a flat, around 1 to 1/2 inch in size along with a few smaller flats or filberts, and assorted rounds, and one or two detail brushes. Acrylic Paint: GOLDEN & Liquitex are professional grade, If you would like to use a student grade, try Winsor and Newton Galleria or Basics by Liquitex. There are a dizzying number of colors available for acrylics. If you're a beginner, start off with the 10 colors below. You can mix them to create other colors as needed. Another option for beginners is to start off with an acrylic paint set. This will save you some money per tube and give you a good place to start. Often it's helpful for beginners to not think too much about materials and just start painting. GETTING STARTED: BASIC ACRYLIC PAINTING SUPPLIES!!!! If you want to get started with acrylic painting, here is the low-down on all the artist supplies you will need! 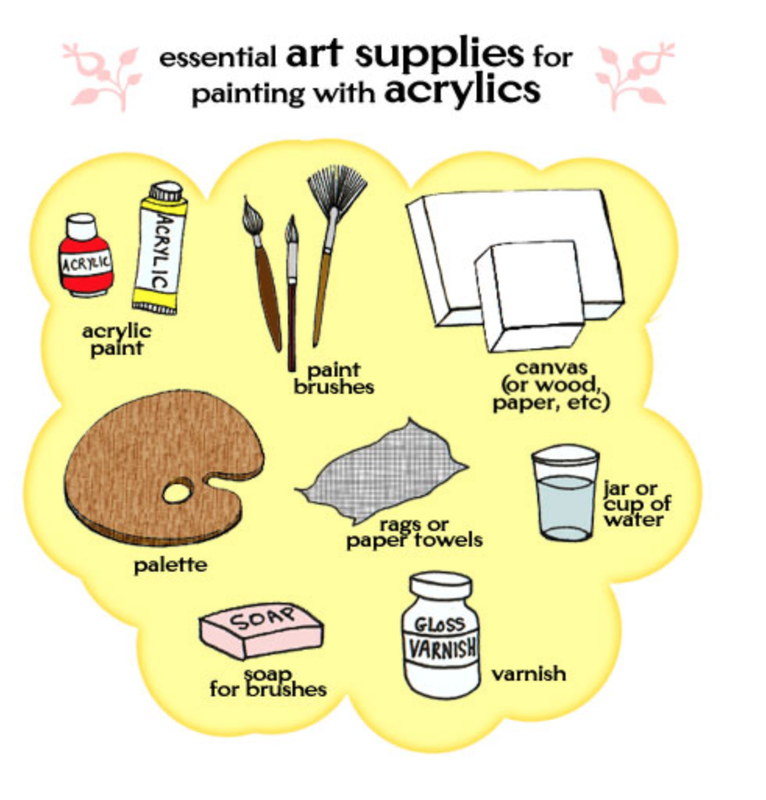 The artist supplies listed below are all essential for painting with acrylics. This means that you really shouldn't attempt to paint with acrylics unless you have all of these supplies on hand. You may substitute gloss varnish with any gel medium you have. You can use a mat or gloss. Liquitex makes a gloss or mat medium that is also a varnish. Golden makes great mediums as well. Chairs, tables, and table easels are provided. However, drawing boards and standing easels are limited. You will need reserve one in advance or bring a portable standing easel if you are used to standing when painting. Cancellation Policy: Students must cancel within a week in advance to receive a full refund. Cancellations that are any later than a week in advance will only receive a 50% refund. Those who do not give at least a 24 hour notice will not receive a refund.